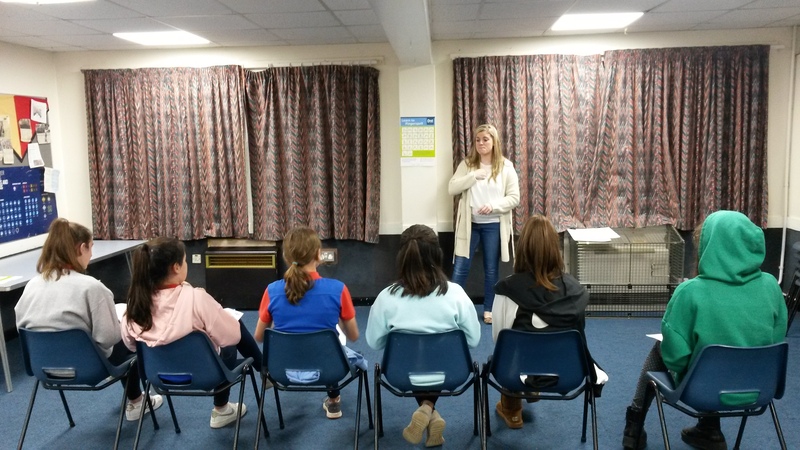 Lovely example of our community work last night – Lisa ran 2 workshops for the 1st Knaphill Guides. They are working on their Communication Badge, part of which is learning BSL. Their leader organised a ‘Disability Awareness Evening and asked us to be part of it. Lisa enthusiastically explained (in BSL, interpreted by a Communication Support Worker) how she grew up Deaf, went to Deaf schools, then moved into the Hearing World when she went to University. The Guides had the opportunity to ask her any questions they wanted. Lisa then taught them how to fingerspell, count, meet and greet people, and chatted about all the activities they do during their meetings and at camp. We hope some of the girls will be inspired to carry on learning and will join our Level 1 course in February on Saturday afternoons in Woking. Thank you for inviting us. Please contact us if you would like a visit to your school or youth group.